While I would love to hear from any of the above, I'm particularly interested if you are a collector of steel pens and you don't fit into one of the three categories above. I will admit to being one. My collection is mainly American pens, but it's starting to include more British just because it's harder to find US-made pens that I don't already have. I appreciate the everyday pens, the ones for writing letters, filling out ledgers, guestbooks and order forms. I particularly like the custom imprints, like the ones I have for Chicago Public Schools, or Western Union, or my sub-collection of railroad nibs. I'm also very interested in the history of the pens. There were actually not very many true manufacturers, though there were more than are normally recorded. It's not always easy to confirm if someone was a manufacturer, or just had pens made by one of the big firms and marketed them under their own name. (the vast majority of US pens fall into this category). I capture some of my research on my website, https://thesteelpen.com/. So, speak up if you too like the underappreciated, the neglected, the common steel pen. Do you have a specific focus in your collection? A particular kind or maker of pen you are always looking for? Do you use your pens? What kinds are your favorites to use? Lovers of the steel pens, unite! Okay. I'll jump in, but you already know me. My first dip pen was a gift from my daughter, an agate and brass holder with a bronze Esterbrook 314 nib. I bought a few more 314s because they were easy to write with, and I turned a few wood holders for the [steel] nibs I received as a gift. I purchased a few more from Pendemonium [all steel], all of which are designed for everyday writing rather than calligraphy, which I have no interest in, although I would like to learn to write like some things I've seen from your pen. I currently have about 20 nibs and perhaps 5 holders that will suffice. However, I have found that minor variations in the shape of the holder can improve the feel of the pen in the hand so a few more may come off my lathe. Oh, I did buy a bag of walnut powder from Highland Woodworking to make some walnut [sepia] ink. Edited by corgicoupe, 14 September 2018 - 21:45. I have collected some steel nibs but only one plastic holder. I have some Esterbrook nibs, some Hunt Speedball nibs. I have used them to replace the old sharp wood stick I used to draw with. I have about a dozen vintage wood dip pen holders and a steel one somewhere in my collection. I have about 80 varieties of vintage dip pen nibs which include original boxes of new condition vintage stock. About 500 nibs altogether. I use,some of them in my art work. I've been using dip pens since before I really got into fountain pens, but until recently I wasn't aware of how diverse the vintage nibs were. I've picked up a few Esterbrooks lately, but two hurdles I find when using them is the scratchy feel to them and that fountain pen inks seem to bead up on the nib. I can't seem to get the manufacturing oils off them despite using several gentle methods. I haven't tried the lighter method or putting the nib in my mouth yet. Any tips? Is it just the nature of water based pen ink to bead up more than India inks? Pelikan 4001 works quite well. I have followed Andrew for some time now and thoroughly enjoy his Steel Pen blog at http://thesteelpen.com. My very modest collection consists almost entirely of US made steel pens. Some of them come from garage sales, estate sales, local antique stores, and a few from Etsy and Ebay. My cousins have some great pens that were owned and used by my grandfather and greatgrandfather and I am in the process of gathering them into my collection. A consumer and purveyor of words. So nice to hear of others, some I knew, some I didn't. So, what are some of your favorite "overlooked" pens? Mine tend to vary by mood. The Eagle E840 (seen above) is one of them. It has some flex but not so much that it makes it difficult to "drive." I also like the Turner & Harrison 70. It's a good, all around fine pen with a smooth tip. 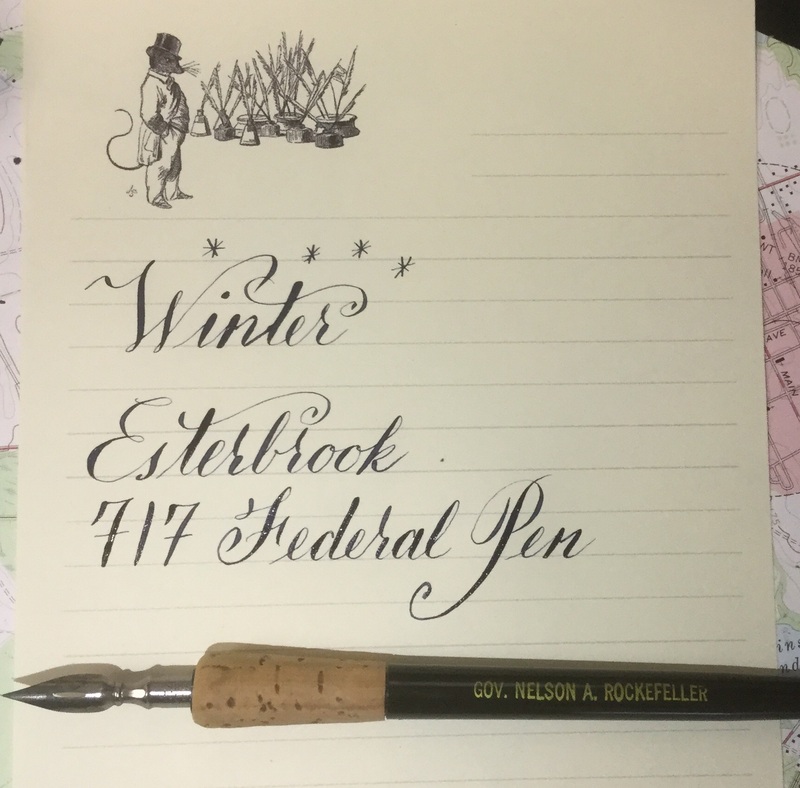 I'm also quite fond of the Esterbrook 717 Federal pen, one of the small, pinched-waist spoon nibs. There are others, like the Vertical Writers, many of the Modified Slant pens, and most school pens. One's I am not particularly fond of include the big spoon pens. I'm also not terribly fond of most of the long, fine stubs. I much prefer a short stub like an Esterbrook Chancellor or a Hunt Vassar. I also like the medium length stubs like the 314 Relief and Spencerian Society Stubs. And my writing is too small for the big broad stubs, like the Esterbrook Blackstone, to be of much use for me. They can be fun to play around with, but even Esterbrook labeled it as a Signature Stub, for big, impressive signatures. But, to each their own. Favorites, and ones you avoid? Your writing doesn't look to be that small, Andrew. What's the spacing of those lines? After reading the steel pen blog a bit it answered a lot of my questions about trouble using fountain pen ink with dip nibs. I understand a lot more about the differences between the stub pens like the Esterbrook 312, which were meant to replicate quill pens, and the sharp pointed pens for calligraphy, too. So, I write my blog and imagine I'm geeking out over steel pens at the whole world. It's gravy when someone actually listens. You know me ... I am always lookinh for that Washington Medallion steel pen. I am haulting as many French nibs as possible...sadly my ebay account is under restricted order not putnpush the buy it now button. So I rely on iBid most of the time. My collection of usable pen are everywhere...because I practice BP, Engrossing, italics and now OP. I need all the nibs I can carry. Andrew, you still owe me some nibs ... Some sort of flexible nib sampler that includes both pointed and stubs of varying size. No rush....I have way too many pens to burn into.. Right now, really hot hot on Tremplin 160. This nib makes me forget about Esty 128 or Gillot 303 and 404. I hope to see you capture all your nib collection and writing samples...and assemble into a Db like the Esty Project. Most of my dip pens are of the glass nib variety, but I have a couple of inexpensive plastic nib holders in which I use Chicago School District penmanship nibs. 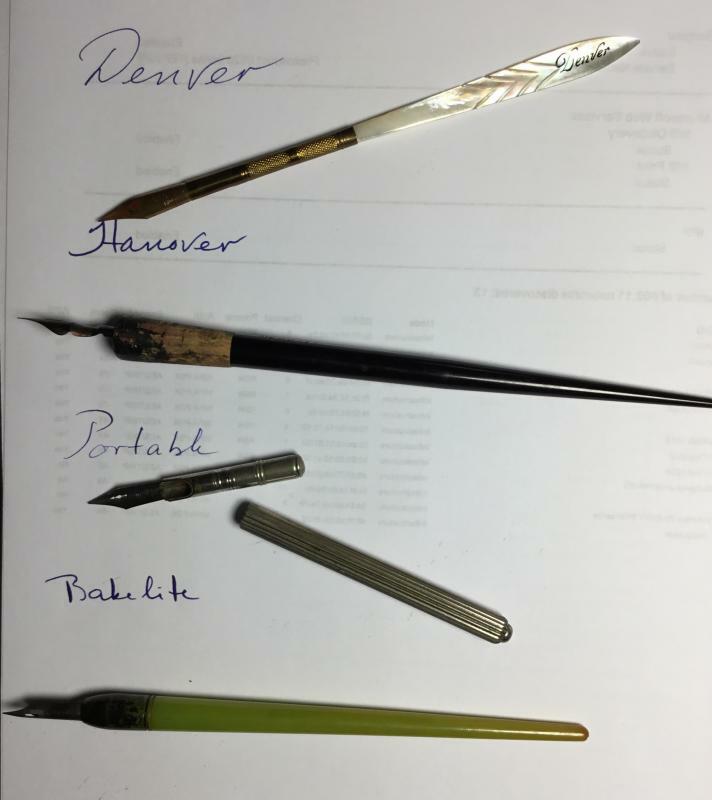 I'll have to track down more of those nibs; I have little interest in learning calligraphy. but I love writing cursive with dip pens. 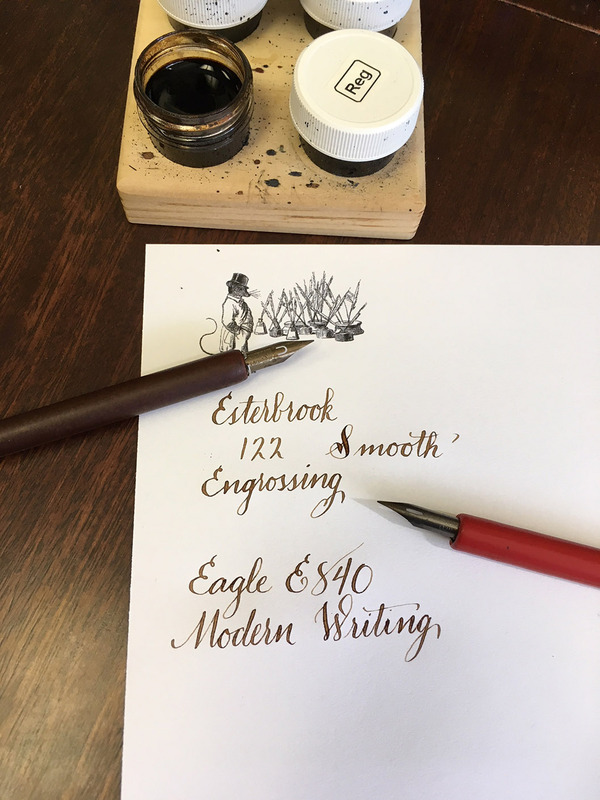 Also check out Eagle E840 Modern Writing, any of the Esterbrook Vertical or Modified Slant nibs, the Esterbrook 048 Falcon, or any of a dozen, dozen different kind of pens that were made for normal, everyday sort of writing. The fun part is finding out how all of the different ones feel when writing. Each is slightly different. I'll have to try some of those, thanks. I have a bunch of nibs (mostly Esterbrook), and probably more than a lifetime supply of some of them, based on how little I use them. I seem to have found a standard with the Zebra G. Does modern chrome plated steel qualify? And the Zebra G is making my Esterbrook stash last even longer.